Life Balance Exercise: How’s Your Awe? I just finished reading Awe by Paul David Tripp, second time, first 2017 reading. If you’ve yet to read it, I encourage you to bump it up your list. Here’s an example why. Chapter 13 is entitled “Work.” The challenge is to consider how your awe of God compares to your awe of work. Could it be that you’re asking work to do for you what it cannot do? God is too wise and loving ever to call you to one area of responsibility that will necessitate you being irresponsible in another. The drawing above illustrates Tripp’s challenge. These domains are what we have been given in life, our calling. Keeping them in balance, owning our responsibility is vital. In each individual domain, rate your awe of God in that domain using a scale of 1-10. 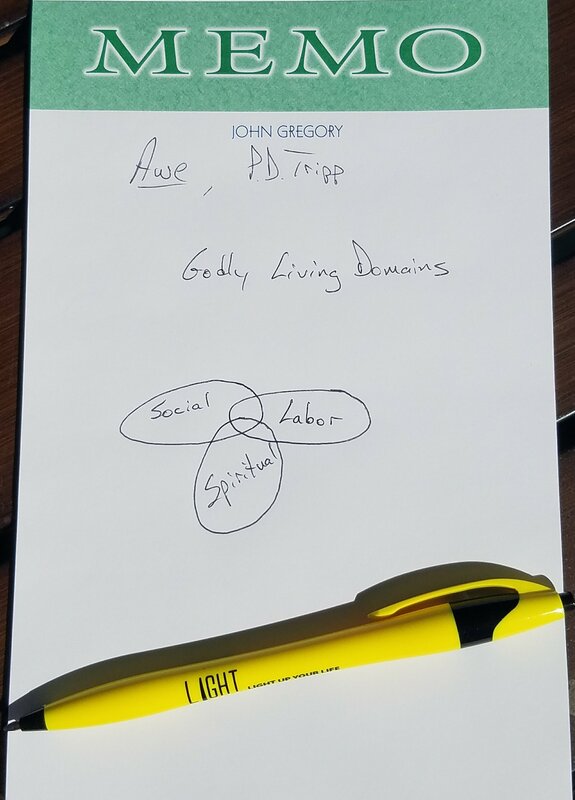 What can you address in these domains to achieve better balance and responsibility and to deepen your awe of God?